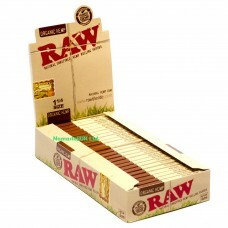 RAW hemp natural unrefined cigarette rolling papers, 1 1/4 size papers. 24 RAW organic 1 1/4 size cigarette papers, 32 leaves per booklets. RAW organic hemp papers are made from organically grown chlorine free pure hemp and is processed in an eco-friendly manner. which results a very thin light tan paper that burns extra slow and extra clean. It uses the same proprietary criss-cross run-preventing watermark as RAW Classic but the colour is much lighter and varies depending on the shade of the hemp used in production. Features RAW organic 1 1/4 size rolling papers.